Back before I was the full bore pen addict that I am now, the Uni-Ball Vision was always one of those pens that I flocked to. It came in an 0.5mm tip size - which is always what I used before discovering the real micro tips - and the ink flow was like no other. I really enjoyed using it, but as I amassed more and more pens, the Vision was pushed to the side. This new Uni-Ball Vision Needle jumped into the fray recently though, and has pulled me back into Uni-Ball Vision land. You would be hard pressed to find a better looking pen on the store shelf right now. This new design is really sleek with the black body and silver racing stripes, and it all just flows down to a perfectly designed tip. The ink flow is great, but I did find that the lines weren't quite as crisp as I like. 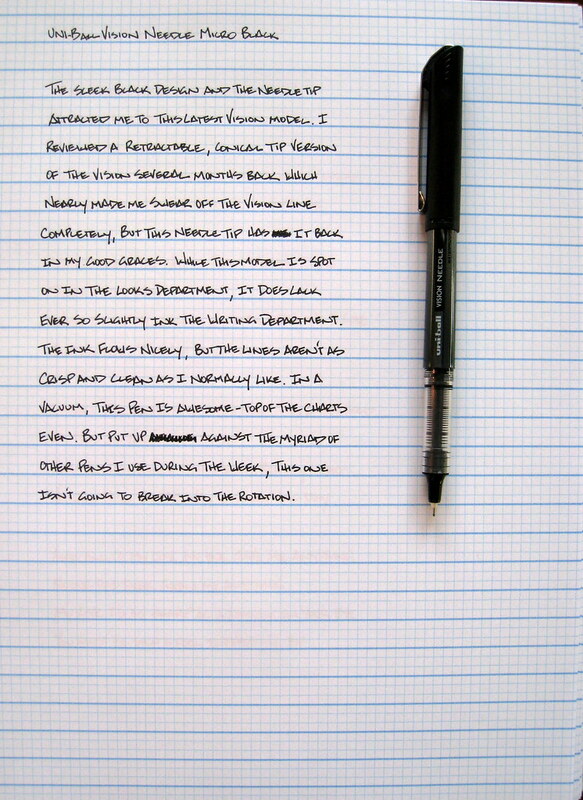 I think I summed it up perfectly in the written review: in a vacuum, this pen is off the charts awesome, but it is not going to break into my rotation of Pilot Hi-Tec-C's and Uni-Ball Signo DX's and the like. My wife is in love with it though, which in all honesty, that's what I think Uni-Ball is going for here. They need to appeal to the masses in the big box retail and office supply world, not just some niche pen nerd, and this pen does a great job of that. Posted on August 26, 2009 by Brad Dowdy.